Geneva, June 19, 2018 – A new report calls for governments and private industry to join forces to tackle global malnutrition, saying that achievement of the nutrition-related UN Sustainable Development Goals requires leveraging the clout of companies, financiers and shareholders, working alongside governments and NGOs. 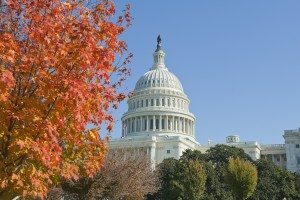 The report comes from the Global Alliance for Improved Nutrition (GAIN) and the USCIB Foundation – the educational arm of the United States Council for International Business. It was prepared in follow-up to a roundtable of experts in global health policy held last October in New York. The report was launched today in Geneva alongside key World Health Organization meetings aimed at promoting adolescent nutrition. Haddad and Robinson presented a draft set of Guiding Principles of Engagement developed by a group of 20 public-sector and 20 private-sector representatives at the October roundtable. These representatives challenged themselves on how best to get governments and industry to work together to build pro-nutrition food and beverage markets, in order to combat malnutrition and help achieve the SDGs. Global food and agriculture constitute a $7.8 trillion (U.S.) industry, employing up to 40 percent of the working population in most countries. The report calls for much more openness and engagement in removing obstacles to foster this cooperation with greater focus on doing good together. 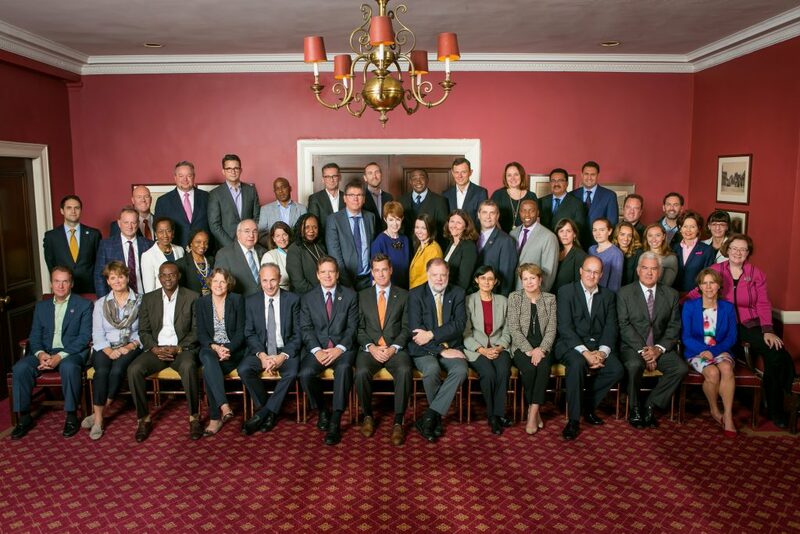 The report, “No More Missed Opportunities: Advancing Public-Private Partnerships to Achieve the Global Nutrition Goals,” was prepared with Wilton Park, a leading host of critical development dialogues. The USCIB Foundation is the educational and research arm of the United States Council for International Business. Its purpose is to promote the benefits of a free-market economy and the role of the private sector as an engine for economic growth and social development globally. 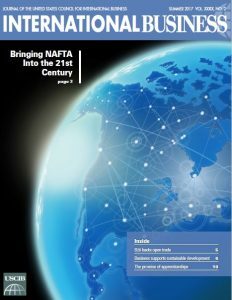 The Foundation advances this mission primarily through its work in conducting information-based research to educate and engage policy makers and the public to develop sensible regulatory policies based on data that will strengthen trade, investment, innovation and sustainability through environmental management. More at www.theuscibfoundation.org. USCIB’s Food and Agriculture and Healthcare Working Groups met last week with Stefano Scarpetta, director of Employment, Labor and Social Affairs for the Organization of Economic Cooperation and Development (OECD). The meeting reinforced longstanding USCIB and Business at OECD cooperation in other issue areas and the need to improve the engagement between business and the OECD Health Committee. USCIB outlined four areas of recommendations to Scarpetta in the hopes of improving future interactions with member states and the health division secretariat, including helping member states understand the role of Business at OECD and its national affiliates, tracking input from Business at OECD and national affiliates, increasing diversity in perspectives among OECD health division staff and better use of OECD expert groups. “The OECD benefits from broad input from the private sector on its work on health policy. We believe that increasing the number and diversity of business representatives allowed to attend OECD Health Committee and related expert group meetings can only improve OECD’s work in the health sector,” said Mike Michener, USCIB’s vice president for Product Policy and Innovation who leads USCIB’s work on health, food and agriculture. Michener noted that while concerns remain, good progress was made in initiating an improved dialogue with the OECD Health Committee going forward. Well-designed health policies that are put into practice are essential for the growth and productivity of our economies and the well-being of our societies. This was the main message from private sector, government representatives, and the OECD gathered for the 2nd Business at OECD (BIAC) Annual Forum on Health. The Forum saw the work undertaken by the private sector to develop truly integrated healthcare, foster innovation, and promote balanced choices for improving well-being. “The digital transformation of healthcare systems will provide fresh opportunities for better care, newer treatments and greater focus on the needs of patients,” said Nicole Denjoy, chair of the BIAC Health Committee. “To achieve this, we need policies that create the right incentives and collaborative environments to drive investment in innovation and technology” she added. 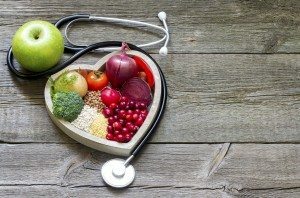 Experts also addressed efforts to encourage balanced nutrition and active lifestyles as an important part of the fight against non-communicable diseases. Speakers stressed the critical role that policy coherence in the fields of health, trade, finance, industry, and education sectors plays in supporting growth and productivity. 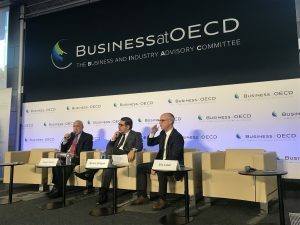 Commenting on the role of international collaboration, OECD Secretary General Angel Gurría stated, “Poor health harms people, lowers productivity, and ultimately undermines growth. 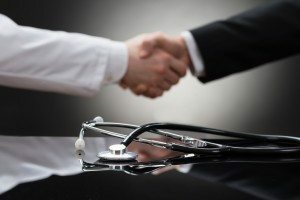 The OECD is supporting the business community’s efforts to help shape the future of health policy and promote good employee and customer health”. The Forum was moderated by Riz Khan, international journalist and TV host. The UN Sustainable Development Goals (SDG’s) were created to measure progress and achievements towards a sustainable future through a series of 17 goals adopted by the UN General Assembly under the moniker Agenda 2030. During this year’s annual UN High-Level Political Forum, held from July 10 – 19 at UN headquarters in New York, the UN Secretariat worked with member states to discuss paths to implementation and to track progress on the SDGs. USCIB and its members were on the ground during the HLPF highlighting the role of engaging all business sectors to advancing environmental, economic and social cooperation for the UN 2030 Agenda for Sustainable Development. 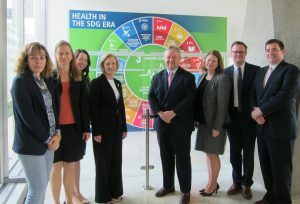 USCIB Vice President for Product Policy and Innovation Mike Michener supported USCIB’s longtime partner, the International Agri-Food Network (IAFN), on their event focusing on SDG2, Ending Hunger, during their side-event, Agriculture and Food Day on July 13. IAFN partnered with leading organizations to host this event to celebrate, discuss, negotiate, analyze, and brainstorm around the role of the agricultural and food sector in relation to the implementation of the SDGs. Agriculture and Food Day summarized the importance of targeting the agricultural sector and food issues to reach the SDGs by 2030. IAFN has been a consistent champion for a stand-alone goal on sustainable agriculture and food security. However, “solutions cannot address just one goal, but must look to make a difference to several at once,” noted Michener. “The purpose of Agriculture and Food Day was to examine how focusing on agricultural and food policy could achieve not only Goal 2 but make substantive contributions to the achievement of the other 16 goals. Investments made in agriculture — the dominant occupation for the world’s poorest people — can accomplish much beyond Goal 2, including improvements in health, incomes, trade, infrastructure, and the environment,” he said. 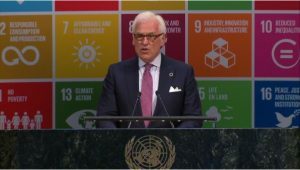 USCIB policy experts and members also joined the SDG Business Forum on July 18, the first business-organized meeting held in the UN’s General Assembly Hall. Speakers from the UN, governments, NGOs and business discussed private sector investment, information sharing and public-private partnership to take forward the 17 SDGs. The Forum was organized by the Global Business Coalition for 2030, a coalition of major business organizations and the UN Global Compact, facilitated by the International Chamber of Commerce (ICC). Speaking to the HLPF, USCIB Vice President for Strategic International Engagement, Energy and Environment Norine Kennedy stated, “Innovation, infrastructure, economic growth and empowerment and good governance are the four inter-linked cornerstones for all 17 SDGs for business. Therefore it is crucial to consult with private sector groups at the national and regional level to develop enabling frameworks for business actions to advance the SDGs,” she said. Over 40 countries submitted national reports this year on their progress towards the SDGs. Many of the speakers echoed the sentiment that neither the SDG’s nor the wider 2030 Agenda can be achieved without active participants of non-state actors, including business and industry, to drive inclusive economic growth and prosperity. USCIB member KPMG’s Nick Chism, deputy head of Global Sales and Markets and global chair of Infrastructure, Government & Healthcare, discussed the importance of creating business-friendly environment and opportunities, indicating that enabling environments will lead to more private sector investment. 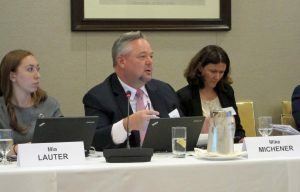 For this year’s HLPF, USCIB members, including Bechtel, Cargill, Citi, Hilton, Monsanto, Novozymes and Pirelli, added new examples of actions to advance the SDGs to USCIB’s Businessfor2030 web platform. USCIB’s Vice President for ICT Policy Barbara Wanner also attended an event, Accelerating Women’s Economic Empowerment to Achieve the 2030 Agenda, which was organized by ICC and UN Women – the global champion for gender equality. For many women around the world, ICT’s can be leveraged for personal security, better access to education and jobs, financial inclusion and access to basic healthcare information. But benefits such as these rely on women having meaningful access to ICT which can be facilitated or prevented by several factors, including affordability, relevant content, skills and security. The event showcased the global efforts stakeholders have embarked on to bring women’s economic empowerment to the forefront of all the SDG targets. “Through innovation, investment and development of products and services, the private sector plays an important role in advancing gender equality and improving the lives of women,” said Wanner. ICC highlighted several private sector initiatives during the side-event that are catalyzing women’s economic empowerment in developed and developing countries and presented the role of ICT’s in advancing the SDG’s. For additional information on this event, please visit ICC’s website.